Are the end of course standards too low? Beginning this year, high school students must pass new end of course exams in a variety of subjects in order to be able to graduate. These tests begin in the ninth grade and continue through the 12th. The standards will be relaxed for the first couple of years while everyone gets used to them. Some people think the state is going too easy on the schools by doing it that way. But a prominent business leader and the head of the state’s largest school district suggested the lower bar at the outset will give students, teachers and the public a skewed picture of schools’ performance. Grier said he would prefer to start with the higher standards, even if it means more schools earn the state’s lowest academic rating. The standards also drew criticism from Bill Hammond, the president of the Texas Association of Business. Hammond said the scores should accurately reflect whether students are being prepared for college and careers. 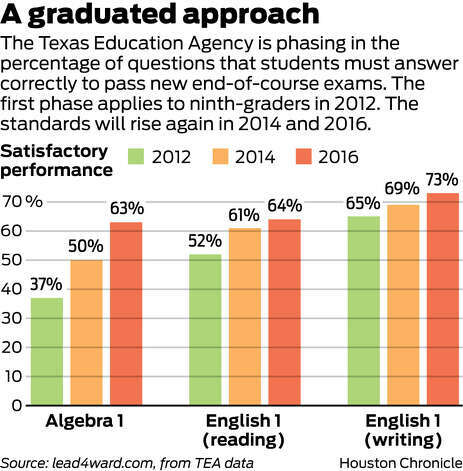 The TEA plans to release statewide scores from the new tests, called the State of Texas Assessments of Academic Readiness, this week or next. Scattered reports suggest that students struggled, even with the lower passing standards. Ninth-graders who took the exams in spring 2012 must answer between 37 percent and 65 percent of the questions correctly to pass, depending on the subject. By 2016, freshmen will need to correctly answer 60 percent to 70 percent to pass most of the exams. TEA spokeswoman Debbie Ratcliffe said districts should have reports this year that show how students would have done had the higher standards been in place, so the information can be shared with the public. I guess I don’t see what the fuss is about. It’s normal to phase things like this in, the only difference here is the four year timeline instead of a two year timeline. Based on what Ratcliffe says, the schools should know exactly where they stand even if their rating starts out higher than where it would have been. You can see the TEA’s STAAR Resources page for all the relevant information. The main concern that I have heard about the STAAR tests, beyond the usual aversion to our increasingly standardized-test-centric school culture, is that it will exacerbate our already worrisome dropout problem. These tests are a big change, and we’re implementing them at the same time as we’ve slashed five billion dollars from public education. I am perfectly fine with taking it slowly to see if there are any negative effects before going all in on yet another high stakes test.